Even before the acclaim on the festival circuit and wins at the Japanese academy awards, I was interested in this film because of the director. Takashi Miike is a name that promises exciting, twisted and bizarre films so it is surprising that 13 Assassins is actually a serious remake of a 1963 film. 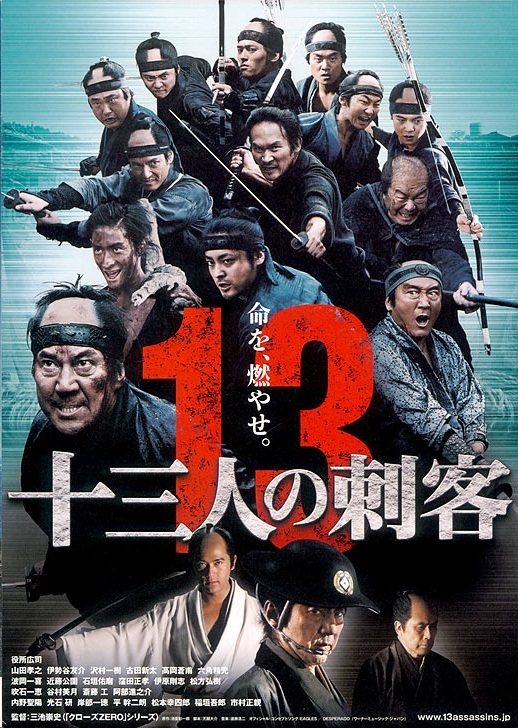 13 Assassins is concerned with the problems of the feudal system and the samurai code; how officials like Naritsugu can abuse their power, how samurai willingly sacrifice themselves for Lords who toss away their lives and the difficultly samurai find in an era of peace where their skills are no longer required. These themes are throughout the film. Most samurai we encounter are either in financial straits or in service to a system they acknowledge as flawed. This subtext is played out in the battle between the antagonist Naritsugu and the hero Shinzaemon. We witness some of Naritsugu’s depraved acts and abuse of power, the evidence culminating in a grotesque spectacle that sees Miike at his extreme and leaves the audience in no doubt that Naritsugu is pure evil of an aristocratic sort. The scene is shocking, blood curdling even. It is made more powerful when you see the shock then delight that Shinzaemon displays in the same scene (brilliant acting): laughter bubbles from him as he states, “How fate smiles upon me. As a samurai in a peaceful era, I have been longing for a noble death.” He knows that his mission goes against the Shogunate system he has served and that it is almost certainly suicide but living in an era which no longer requires him is painful and taking out a sadistic monster who threatens the stability of the country is a good way to go out. The first half of the film details the problem posed by Naritsugu and sets up the question of how Shinzaemon, will make his move, what stands in his way and who he will recruit as the twelve other assassins. When Shinzaemon does make his move, it is spectacular. The final fight is visceral; witnessing the chaos hundreds of men fighting for their lives, dashing around from one set piece and awesome battle to the next packs a punch. It might have been exhausting and confusing except everything is well paced, with a flow that works well with the director’s choice of shots, especially when hand held camera and over the shoulder shots put you in the thick of the fighting, intercutting between each of the assassins as they wage their desperate fight against overwhelming odds. As the fight approached I was tingling with anticipation and throughout the fight until the ending I was on the edge of my seat. It culminates in a magnificent duel that brings the various subtexts to a bruising clash and fitting end. The last time I felt anything like this excitement was during climatic finale to Inception. Both Inagaki and Yakusho are magnificent, Inagaki providing a compelling antagonist who displays all of the aristocratic arrogance, delusions and lunacy his character requires whilst Yakusho is the right man to play the hero, grizzled yet charming and ironic. Despite the drama and tragedy of events, there is still a vein of humour in the film, whether it is from samurai who let slip their mask of seriousness through a joke or error or through the way situation may pan out, the absurd is used to add levity to what could have been an overly-serious tale and humanise characters. Period details are gorgeous. The sets are fantastic, screen doors in dojos and mansions creating areas of secrecy and danger, the village/death trap is packed with great set-pieces. As for the characters, everything from samurai chonmage and the make-up and shaved eye-brows of the Kiso women and the costume and regalia of samurai and retainers as they march through the landscape and do battle is magnificent. It all had the look of another world, something from the past and I was transported there. As I walked out of the cinema I felt alive and let out a laugh. 13 Assassins is truly a brilliant film and I’m watching it for a second time today! Okay, I was excited to see this anyway, but your review REALLY has me psyched! I gotta see this asap!! I don’t need to tell you this because you have excellent taste in film buuuut… Go see it now! Film of the year! 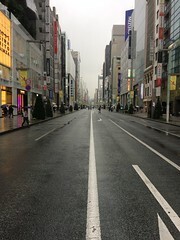 News from Cannes suggest that his next film, Hara-Kiri, is meant to be less blood-thirsty but just as good. Hi Jason, I also enjoyed this film. Good review.